Global Finance brings together a group of industry leaders to discuss the prospects for the exchange-traded derivatives market. Global Finance: The global financial system has come through a near-death experience. Almost everyone believes new regulations are required to avoid a repetition. Which proposed regulations that affect exchange-traded derivatives do you believe make sense? Craig S. Donohue, chief executive officer, CME: The vast majority of the legislation that we see, at least in the United States, is oriented toward either customer protection or more significant regulation for over-the-counter (OTC) derivatives markets. There's far less in the legislation that actually pertains to the exchange-traded and centrally cleared markets, which is a reflection of how well the exchange-traded and centrally cleared markets have functioned—particularly during the economic and financial markets crisis. On the listed market side, we have been very supportive of systemic risk regulation, but we are concerned about the way in which that would be accomplished. Both the Securities and Exchange Commission (SEC) and Commodity Futures Trading Commission (CFTC) have done a very good job and have a tremendous amount of expertise in the oversight of central counterparties, whether they are registered securities clearing corporations on the securities market side or derivatives clearing organizations on the CFTC side. 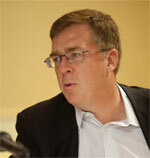 Craig S. Donohue has served as CEO of CME Group and its predecessor company, CME Holdings, since January 2004. Donohue oversees the world's leading and most diverse derivatives marketplace and a global workforce of more than 2,000 employees. He has also led the completion of more than $20 billion in mergers and acquisitions, including CME's historic acquisitions of the Chicago Board of Trade (CBOT) in 2007 and the New York Mercantile Exchange (NYMEX) in 2008. Donohue serves on CME Group's board of directors, as well as the boards of BM&FBovespa; (the largest exchange company in Latin America), the World Federation of Exchanges and the Managed Funds Association. William J. Brodsky, chairman and chief executive officer, CBOE: As you look back over the past 18 months, one of the things that worked was regulated exchanges—all over the world, without distinguishing between stocks or options or futures or US or non-US. Very little that has been put forth would in any way inhibit exchange markets. Having said that, the SEC in the US recently proposed re-imposing the uptick rule on short selling—I believe as a result of political pressure—but only in the case where stocks go down 10% in a day. That raises the question of what happens on a global basis where you have the same products trading all over the world with disparate regulation. That's where the lack of harmonization is really a problem. I've seen very little put forth so far that would harmonize any of these things. William J. Brodsky is the chairman and CEO of the Chicago Board Options Exchange (CBOE) and the chairman of the World Federation of Exchanges (WFE). Prior to joining CBOE in 1997, Brodsky served for 15 years at Chicago Mercantile Exchange (CME), where he oversaw the launch of CME Globex and the development of stock index futures. He began his career as an attorney in the securities industry with law firm Model, Roland and Co. in 1968. In 1974 he joined the American Stock Exchange (AMEX), where he headed options trading in 1976 and served as executive vice president for operations from 1979 to 1982. 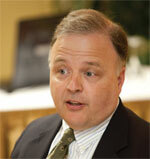 He was honored by AMEX in 1994 for his role in the development of its options programs. Patrice Blanc, chief executive officer, Newedge Group: One of the issues we faced during this crisis was the lack of transparency. Listed derivatives markets, which represent Newedge's core business, are very transparent, very liquid and work very well. Even under huge stress, we haven't seen any major issue or default. Everything worked fine through the financial crisis. Regulators should—and I think they want to—bring more transparency to the marketplace, to make prices available for everybody around the world. This is one key issue regulators should focus on, because more transparency means less systemic risk. Blanc was named CEO of Newedge Group on the launch of the company in January 2008. Newedge is a 50/50 joint venture that brought together the businesses of Fimat and Calyon Financial. Blanc joined Fimat Paris as the head of the firm's trading desk on the MATIF in 1989 and became deputy general manager of the branch in September 1991. From July 1994 through 1997, he was responsible for establishing Fimat's office in Brazil and was appointed Fimat Brazil general manager in January 1995. 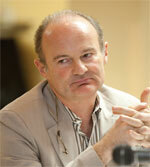 In November 1997 Blanc joined Fimat New York as general manager and became president and CEO of Fimat USA in July 2000. Blanc has 23 years of experience in the derivatives and financial markets. 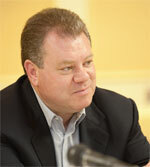 He is on the board of the Futures Industry Association. Bernard W. Dan, former chief executive officer, MF Global: Some of the things going on are potentially not as positive for the listed world—some of the discussion on position limits for energy, in particular. It's a populist-driven solution to try to control volatility and price, but there are other ways to do it than by limiting participation. It's potentially not good for the industry, but if it is going to be instituted, I would rather have the exchange do it than the CFTC because the exchange is much closer to the marketplace, understands position accountability and—to their credit—stood up and said they would institute it. What's the negative of that? What made this industry strong is the deep liquidity and the transparency. With better reporting, better transparency, better association of the real position accountability rules, the exchanges could manage that, without major problems and with much bigger markets. Note: Since this roundtable took place, Jon S. Corzine has taken over as chairman and chief executive officer of MF Global. Garry Jones, group executive vice president, head of global derivatives, NYSE Euronext: At a presentation I gave recently, I put up a slide showing a list of proposed regulations—central counterparties, careful control of risk, transparency and so on—and asked the audience to guess when it was written. Everyone guessed this year or last year, but it was actually written in 1999 after the Long-Term Capital problem. Virtually all the issues that are mooted at the moment by regulators on both sides of the Atlantic were listed there in 1999. The problem this time, though, is different. We were very close to a very serious collapse—in lots of ways. But here we are, a couple of years later, and banks are rebuilding their balance sheets; people seem to be getting back to normal. I hope people don't forget the potential cataclysmic problems we had and go easy on everything because already I'm seeing some things watered down because of the difficulty, on both sides of the Atlantic, to actually get things done. I hope we do learn from past mistakes. 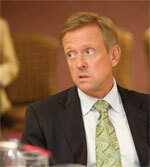 Garry Jones is the group executive vice president and head of global derivatives for NYSE Euronext. He is the CEO of NYSE Liffe, the group's global derivatives exchange, and a member of the NYSE Euronext management committee. Jones joined NYSE Liffe from ICAP, where he was CEO of ICAP Electronic Broking (Europe) and, prior to the merger in 2003, CEO and president of BrokerTec Europe, the bank consortium-owned global fixed-income electronic trading platform. Prior to this, Jones worked for almost 20 years in a variety of senior management roles in trading, sales and research for investment banks in the US and Europe. Jones has an MA from Oxford University and an MBA from Stanford Business School. Clark Hutchison, co-head of listed derivatives, Morgan Stanley: Market participants need a robust environment where buyers and sellers can transact, but also on the clearing side they need an environment where there is plenty of capital in clearinghouses and where there's liquidity to underwrite whatever risk is taken. As a result, one of the recent regulatory initiatives that would limit who can own or have positions in clearinghouses doesn't make sense. The participants today who are largely participating on the exchanges are putting up their capital. To limit their ability to put up capital and to limit their participation actually drives away liquidity and drives away some of the protections that people are saying might be availed by that limitation. "I would like to see the regulators come up with principles rather than mandates"
GF: How hopeful are you about harmonization of regulation? Brodsky: I strongly believe that it is the right way to go when you look at the types of firms that do business globally and the types of products we trade. It certainly would be the desirable thing. But in reality, when you factor in politics and populism, I'm very pessimistic that there'll be any serious attempt to harmonize before the decisions are made. Donohue: There are areas where harmonization could be valuable, but they're quite narrow and discrete, and you need to have different approaches that actually meet the different needs of the different market segments that we're all involved in. What we really have to focus on is the gaps in regulation or the oversight necessary to have the markets function as well as they might instead of making everything consistent just for the sake of making it consistent. Jones: OTC markets and listed markets are essentially continuums of the same market, and, in both, one of the biggest issues is mark to market—what is the closing price of a security on any given day—and secondly, what is the risk management of a position? If you've got bilateral OTC agreement with collateral moving back and forth, that's similar to futures margining. But in many OTC cases that isn't the case. People take each other's credit risk, and they don't actually move money about every day. If nothing else comes out of this, the issue of a proper mark to market and proper point of reference, be that from the exchange or elsewhere, is very important. Secondly, that people shouldn't be allowed to build up large positions with no reference to having to fess up to their losses. Obviously, that then contains leverage to some extent, because if you have to fess up the losses, you can't lever it in the same way. Dan: I'm not optimistic about harmonization. Each country has had such a fundamentally different experience with dealing with the crisis that they're responding to it differently. Some are requiring stringent oversight, more capital, a different sort of tax environment, and that's going to cause companies to move and reduce activities in certain parts of the world. If you're a shareholder-driven company, you can't earn sufficient returns in some of those jurisdictions. On the other hand, price discovery could easily be harmonized in any sort of environment. Managing systemic risk should also be something countries around the world could jointly respond to. Blanc: Regulation harmonization and derivatives standardiza¬tion are good for centrally cleared volumes, so we look at them with a positive attitude. That said, harmonization and standardization are certainly challenging concepts for regulators and some market participants. GF: If OTC products moved to an exchange environment, how would that affect users of both exchange and OTC products? Brodsky: Our foremost objective should be to do everything we can to prevent the next crisis, and it's clear that moving more OTC derivatives onto exchanges, to the extent possible, would minimize that systemic risk. While not every product is suited for exchange trading, since some more complex transactions benefit from the OTC structure, many derivatives can be efficiently traded with the safeguards of exchange trading and common clearing. At a minimum, OTC derivatives that cannot be standardized should have heightened capital requirements in order to reduce the impact of potential failures. Blanc: A question that we have is how, as a futures commission merchant (FCM), we're going to make money. Today, when we execute an OTC energy transaction, we make money on executing the transaction. When I post the transaction on ClearPort, I'm going to have to pay small clearing fees—not a lot, but I'm going to obviously have the risk. This question of how we can make money clearing OTC products is a big one, especially in an environment where interest income is extremely low. The listed clearing business is subsidized by interest income, so the pure clearing business without interest income is barely profitable now. Hutchison: We have to ask what the problem is we're trying to solve. If the notion is that somehow, by clearing OTC products, risk is going to be reduced, the answer is maybe, depending upon the methodology by which clearing is done. And if OTC transactions heretofore are done without margin, then maybe by having those transactions done with margin could eliminate risk. But it might eliminate the transaction altogether if the margin costs imposed are too steep. Eliminating the transaction might not be good because transactions formerly did solve issues between counterparties. So if that margin causes people not to trade OTC anymore and listed markets don't have an alternative, then other risks are being introduced. Finally, if I as a bank have to put up margin money to facilitate all this risk reduction, then I'm a financier that's not getting paid for it—and I'm still not sure what problem is being solved. Dan: The most likely products that are going to clear centrally are those that are already standard-like, such as interest rate swaps. When people talk about OTC clearing, the exotic structured deals are not what they're talking about. Secondly, it's clear from the proposed legislation and regulatory reform in the US, Europe and Asia that the large proprietary traders are going to have to provide more capital to support existing positions and make liquidity provisions to deal with systemic risk. Because of those two factors you'll see an evolution, not a revolution, as some of these OTC products that were traditionally cleared on balance sheets of the large banks transition to exchanges because the banks will have to make better use of their own capital, to keep more in reserve to support existing positions. They're going to want to lay off some of this risk to a central counterparty. Jones: My experience is that trends happen when a spread narrows and narrows so the pricing of the product becomes more commoditized. Trade in US treasuries is a good example: It's virtually electronic now. Foreign exchange is virtually electronic now. Even CDS are moving in that direction, but they're not at the exchange-traded end of the market. It seems to me that banks and other intermediaries will not give their blessing to anything that becomes exchange-like until that product becomes highly commoditized and there's no significant benefit to keeping it OTC. And we're not there yet. Also, as soon as something trades on the exchange with a clearinghouse, the spread narrows and also the ability to charge a different price for a different name goes away. Unfortunately, the regulators don't quite get these trends and they don't see the linkage between the markets. They see them as distinct parts. Donohue: I think that central counterparties likely would be effective in reducing overall system-wide or systemic risks. However, private market solutions always work better than government solutions or mandatory requirements. The energy market is a great example. You've seen a huge evolution toward central counterparty clearing in the OTC oil, gas and power markets without the necessity for government intervention or regulation or legislation. The right solution is to let the markets continue to evolve. Some degree of reporting is the right next step in terms of the evolution of the derivative markets that are off-exchange, and the focus needs to be on what the capital requirements should be that support bilateral exposures between counterparties versus central counterparty kinds of exposures. GF: Will regulators mandate that some OTC products—interest rate swaps, for instance—be traded on exchanges? Dan: I don't think you'll see a mandate, but you'll see things strongly encouraged for greater reporting, greater transparency, and if that means they go to the exchange model because that's the best place, that's what will happen. Hutchison: I would like to see the regulators come up with principles rather than mandates. I want there to be reporting of OTC transactions so we know what's going on. If heretofore we've had a company for which an OTC transaction is very legitimate but we don't know their exposure on their balance sheet, as an investor that kind of reporting and transparency would then get reflected in their books and records and in their accounting audits. That would be a very good thing. And it would be good for the marketplace to know if there's a very one-sided trade in a particular underlying instrument. That's the free market letting transparency rise to the top so people can then make their judgments. Brodsky: First, what happens if you have these principles but the participants don't comply? Second, we can't afford to view market regulation from a purely domestic perspective anymore. The principles established by regulators in one country may not resemble those established in other parts of the world. The financial crisis reminded us that large banks and firms that used OTC were international, that geographic boundaries were blurred, and that cross-border contagion is a very real problem. Hutchison: If you can't enforce the principles, caveat emptor rules. In this last crisis we saw a lot of people assessing what principles applied in different markets in order to choose where they were comfortable operating. It's taken something as dramatic as what we've seen to make people be aware of what they've been doing all along. I don't think you can legislate to solve a lack of understanding of how things work, but you certainly could have principles and get principles to be both sanctified by the regulators and, to a degree, harmonized. Blanc: The private sector initiatives on centrally cleared swaps might actually come before regulation. Buy sides are very keen to see spreads reduction and more transparency on swaps, and they are a key driver behind the trend. GF: How can exchanges in developed markets take advantage of growth in emerging markets? Jones: Two of the top-three exchanges by market capitalization in the world now are Brazil and Hong Kong. Market capitalization is far in excess of some of the older, more established exchanges, so the question is, how can the more established players benefit from this? Established exchanges have to look at two things: Where can we get investors in those countries to trade our products, and how can we partner with local exchanges? CME has done some very interesting tie-ups in Brazil and Mexico and other areas, from joint product marketing to joint product listing to selling technology to working as a provider for them. For example, we've just done a deal with a group of Asian stock exchanges to provide connectivity between the different exchanges so you can trade a stock in Indonesia through a connection in Malaysia or Singapore, and so on. The opportunity is as a service provider, as a partner. Dan: There are three points: network, connectivity and distribution. CME's recent announcements are just along those three themes. So that'll help bring users out of Latin America into the US, because production in certain products is dominated by Latin America. North America and European investors want to access price discovery in that part of the world, and these sorts of tie-ups will enable that. From a user perspective, it's better to have standards, and standards that you have confidence in, particularly in some of those countries where maybe the client protection rules and some of those things aren't as robust as maybe North America and Europe. Brodsky: One of the things we have to keep in mind is that the sophistication of these emerging market professionals is very high. They can find out what they want, so their need to tap into the more developed markets is much less than it would have been, say, 10 or 15 years ago. Donohue: While many of the so-called emerging markets are no longer emerging, there are still widely varying philosophies and practices about how open the market should be to global participation, direct access and a wide range of other business practices. The more established exchanges in more mature parts of the world can provide enormous assistance to exchanges that are still becoming part of the larger global marketplace. We have been something of a leader in this area, doing commercial linkages with our Globex distribution network around the world, coupled with strategic investing. For example, we provide connectivity from our global distribution network into the electronic trading environment in Brazil, and conversely they provide the same from within Latin America to CME Group markets. So if you're trading on the CME Globex platform from anywhere in the world, you have the ability now to do that in Brazil through the same connectivity. In less than 12 months we're 10% of the average daily volume into the Brazilian market. That reflects the fact that all the leading exchanges have very large sophisticated networks with customers that trade a broad range of products that are looking to access these markets more effectively and more efficiently. Jones: It can help reduce their distribution costs, which is a big plus. The big exchanges have this distribution. It would have cost the Brazilian exchange a lot of money to have the same distribution in the States that they could get through the CME network. Blanc: It's extremely important for brokers active in developing markets to promote their products by educating those who potentially may use them. A lot of our products—even simple ones such as listed derivative futures and options—are not well enough understood. I did this kind of work for three years in Brazil, educating sugar mills in how they can hedge their production, educating them in hedging through futures and options. It's really important to keep doing this job in countries where producers are selling their output through trading companies, which, like the dealers, are trying to benefit from them. In my view it's the role of exchanges and brokers to keep educating commodity producers in emerging countries on how to use the futures markets to hedge their risks. If we want customers to use our products, we have also to educate them and help them understand the benefits. GF: How have exchange-traded derivatives performed as an asset class? Dan: This asset class has led the industry during this crisis. That's because of the confidence the users have in the guarantee pools and the daily mark to market and the broader transparency—all these themes we've been talking about. I can't think of one concern in the listed futures industry that we had to endure during this whole problem. Users responded to the crisis with extraordinary volume to manage those risks. If markets that don't have those characteristics could adopt some of them, it might create a great sense of confidence and reduce some of the systemic risk. Donohue: It's not just the recent crisis. The exchange-traded and listed markets have for decades withstood numerous market stresses and situations. Long-Term Capital Management was one, we had the 1987 stock market crash and numerous failures of large financial institutions over time, yet not a single customer has really suffered as a result of that in terms of a failure of performance at the clearinghouse level of a clearing member firm. It's a system that works. The fact that the products are standardized, which is different from the OTC market, the fact that you can have a locus of liquidity in the market and provide liquidity even during times of market stress works really, really well. Hutchison: We can particularly say that with regard to the US, which brings us back to the idea of principles. We've had principles in place for a long time in the US. The exchanges and clearinghouses set out procedures and policies that are known well beforehand, so that when difficult times arrive, there is almost a reflex reaction of what has to happen. There's a set of rules you have to follow if customers are getting into trouble. As a result, those unfortunate situations get absorbed and trading keeps going. The unfortunate part of this past crisis would be that, while futures probably performed better than most any other marketplace and any other regulatory schema globally, it's not quite harmonized. The disposition of customer funds, particularly in the Lehman case, wasn't the same worldwide, and the US stands out for its clear principles and rules about the disposition of customer funds in bankruptcy. So there's more fundamental work needed to harmonize local rules about customer funds. Dan: One comment on that: You're referring to the London situation with Lehman. The reality is, those clients accepted the risk of opting out of segregation. They took a known risk by getting in bed with Lehman and accepting their proprietary trading activities as a counterparty. That's not the regulator's fault; people consciously made that choice. Hutchison: Fair point. The question is, when they signed up for it, did they really understand that? Donohue: Both points are valid, and the real question is, will market practices change, will customers now be more cognizant of the differences? Will they elect not to opt out of segregation, or will the FSA actually evolve to a strict segregation kind of structure like we have in the US versus the type that exists in the UK, in response to what happened? The uncertainty that market participants have had to deal with in terms of having collateral held in limbo for years is not helpful to the system. Brodsky: All the comments on this issue have noted that futures markets in the US worked flawlessly. So did the option markets, and so did the stock markets. That is a tribute to the systems we have and the conventions that we practice on all of our exchanges. Although we have had other crises that we've all lived through, going back to the 1987 crash, to Long-Term Capital Management and a whole variety of other things, none of them reached the magnitude of what we went through 18 months ago. This was bigger than anything we experienced before, and therefore it was a bigger test. These markets that we're all involved in passed with flying colors. 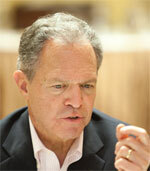 Jones: The crisis may have changed retail investors' attitudes. There's this myth that listed derivatives are riskier than holding stocks or whatever. It's a myth because if you're holding stock index futures, by definition it's less risky than owning a share in a single name. Recently, we're seeing retail investors looking to trade options and coming direct to the exchange. Our French options business, for example, has actually seen the highest percentage growth of any market last year as retail investors are coming directly to exchanges rather than using structured products from banks. Dan: In certain parts of Europe, because of historic stamp duties and so on, other products may have satisfied that risk appetite. So that's a big untapped market out there for the listed world—and there are very few firms that globally cater to that sort of client. GF: In the past, new products and new technology have helped fuel growth and trading activity. Where will the future growth come from? Donohue: There will continue to be lots of new product innovations. We're all finding new product extensions and new product ideas that can be enormously valuable to the market and very successful. In our case, the new ultra-bond futures contract, launched in January, really did meet a market need. Within just seven or eight weeks, open interest was around 80,000 contracts, and average daily volume was 25,000 contracts. Brodsky: People are always looking for the new asset class as opposed to just an extension of what you do well. I'm very pleased with our VIX product, which took us years to develop and is an extension in some respects of our index products but actually is a new asset class because you're actually trading volatility. It has now really developed into something. We're learning that people are constantly finding new ways to use the product and that we can extend it, not only within our own marketplace, but by licensing it to other markets. CBOE recently licensed VIX methodology to CME so that VIX may now be offered on some of their products. Innovation is alive and well. Dan: There are many good examples of the market users working with exchanges to create products or to tweak existing products to make them more relevant. A lot of work goes into all the existing listed products to keep them relevant. We'll also see new users in different geographies. India and China over the next 10 to 15 or 20 years will provide a whole new user base that will be accessing these markets. You'll have products that'll develop for the transition from OTC to centrally cleared markets, and more transparent new ideas like VIX. Broadly speaking, the industry is one of innovation, and technology and new products are going to come through user demand, or great ideas coming from exchange research people. Jones: A lot of the things that we pushed through OTC clearing have come from customer requests. We have a system called Bclear that traded 250 million contracts last year, and a lot of those are new individual contracts that people want us to trade; they're not things we just dreamt up. They'll ask for a particular index or a product extension or for us to change the tick size and make it more granular. Customer requests have had a massive impact on the central order book—offering weekly and daily options on contracts that used to be monthly. These are not rocket science, but they are customer-driven events. We're also working with issuers of government products, such as options on gilts in the UK, which were fairly dormant. It's early days, but the open interest has been quite encouraging. Is this innovation; is it something new? I can't claim it is, but it shows the benefit of listening to your customers. Hutchison: The user community is coming to the exchanges and clearinghouses differently as well. The ways in which futures are transported to the exchange and then to the clearinghouse have increased. For example, 10 years ago users couldn't go through Bloomberg to get to the exchange. Today that happens. The ease with which transactions get to the marketplace and the volume capabilities that people have—the ability to use algorithms—are all helping people to transact what they've always been transacting but in a way that's more accommodative to them. That couldn't happen if the exchanges and the clearinghouses also didn't make the investment to accommodate all of that. User demand has changed the marketplace, but the marketplace itself has recognized the user demand and accommodated it. That just creates more liquidity and also enables some people who haven't traded futures before to start trading because they can access the market now in ways that suit them. Blanc: People use our products to hedge risk. Risk is not disappearing—in fact, risks are increasing—so the volumes will keep growing. But there is a need for more transparency in the pricing. The example of VIX is very interesting because volatility is something even the retail investor wants to know about and understand; it's no longer the preserve of dealers. The public needs to understand volatility today, and, while VIX is a complex product, it's also simple to understand so it is bringing more transparency to the market, and ultimately more volumes.